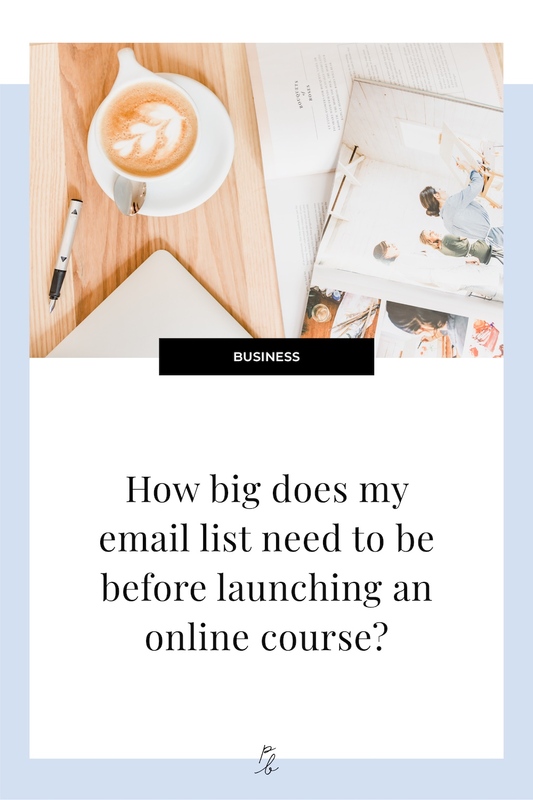 How big does my email list need to be before launching an online course? I’ve been asked a few times to share insights and lessons learned from building and launching my online courses, and today I’m delivering on that! Yes online courses are all the rage right now and there are many people running them super successfully, but I’ve also seen the other side of the coin where someone spends months building their course and they launch it only to get . . . 0 students. Major disappointment? Yep. So just know that yes, an online course can do great things for your business, but online courses are not a guaranteed success route. There’s a lot of really vital aspects that can’t be overlooked in order to launch your course with a bang and bring students in! The most major thing that will predict your courses success? The size of your email list. Now, story time to show you just how vital this is. I was in Mariah Coz’s Accelerator program where there were a few of us going through the course building and launching process together. One girl has 25k Instagram followers. Another had quite a few thousand YouTube subscribers. I had an email list of 2k. Who got the most sales? I did, by farrrrr! Please, please, please do not make the mistake of assuming because you have a big following somewhere else, that that will make up for a small email list. The good news if you’re in that boat however is that you already have followers who are likely interested in your topic, so now it’s your job to get them from wherever they’re following you onto your email list. Let me be super clear, I’m not saying an email list ‘might be beneficial,’ or ‘could help with sales’. No. You NEED an email list. Build the email list first! I cannot, cannot, cannot emphasize enough how absolutely, vital an email list is . . .
How big does my email list need to be? You can expect 1-2% of your email list to convert into buyers of your course. So let’s do some math. Let’s say your course will be $400. And you’re going to spend 3 months working on building your course and the amount your business needs to bring in to cover your life expenses, business expenses and taxes is $5,000/month. So $5,000/month x 3 months = $15,000 is what the course needs to make. To make $15,000 on a $400 course, you need 37.5 sales. And in order to get 37.5 sales, assuming your email list buys at a rate of 1.5%, you therefore need an email list of 2,500. So, if you don’t have an email list yet, or it’s still a small list and you therefore know you need to do some list building first, you can basically follow that math to figure out how big your email list needs to be in order to make the sales you want to generate. There’s no guarantees with the 1-2% rule. Some people blow way past those numbers and some people convert 0% of their email list. But it’s a general industry standard to have in mind in order to ballpark your sales. There’s a couple important aspects to ensuring you hit the 1-2% conversion rate from subscriber > paying student. Let’s pretend you’re a calligrapher and a watercolor artist! You have been building your email list with an opt-in gift sharing exactly the tools you use to create your beautiful calligraphy work. Your course is teaching how to get started with watercolor paintings. … Did you spot the issue? Your opt-in gift is attracting people interested in calligraphy, but your course is about watercolor painting. If you build an email list full of people who are not interested in the topic of your course, you can expect a MUCH lower conversion rate than the industry standard 1-2%. You need to make sure that your email list is full of people actually interested in your course topic. And you do that by creating an opt-in gift which is the perrrfect first step before what your course teaches. The second blunder I see a lot of people running into is that they only show up in subscribers inboxes when they’re ready to sell, sell, sell. We buy from people we know, like and trust. And just getting a sweet opt-in gift is often not enough to build that to the point where someone is ready to buy from you. So you’ve got to follow up your sweet, closely related opt-in freebie with some sweet, closely related, value-packed emails. During your list-building time, be sure to send your subscribers an email at least once a week with some more hellah-valuable information on the topic of your course & opt-in gift. You’ll also love . . .
Why I chose ConvertKit for my email marketing over MailChimp, Squarespace Campaigns, etc.